So here’s the big news: I’m headed to India tomorrow morning! 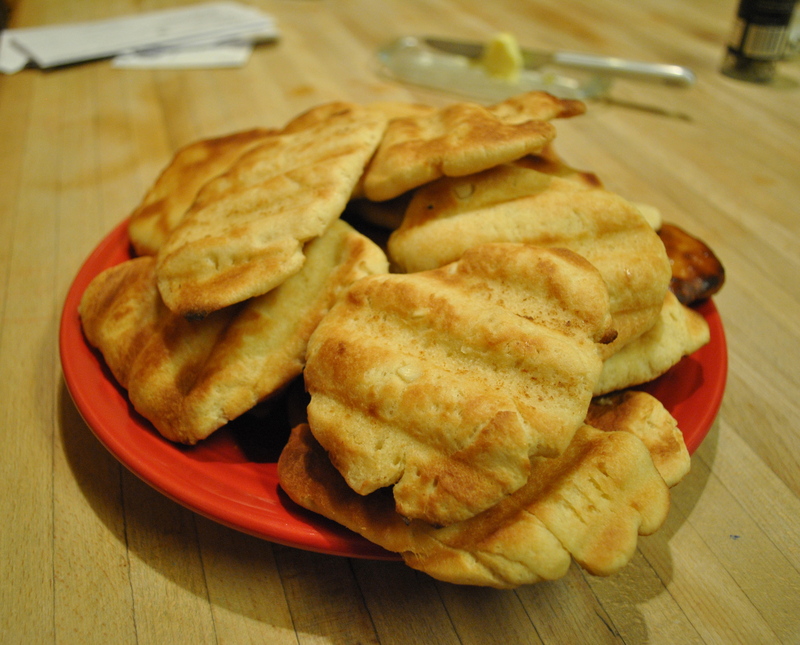 To celebrate that, I’ve posted an Indian oldie but goodie – naan bread. If you haven’t had naan bread before, you are missing out. It’s a flatbread that pairs well with hummus, rice, curry, dahl, and other sides. This is my first attempt at making it, and when I don’t have time to bake, Trader Joe’s has a delicious frozen Garlic Naan as well as some thicker (but still great) packaged naan bread in the bread section. 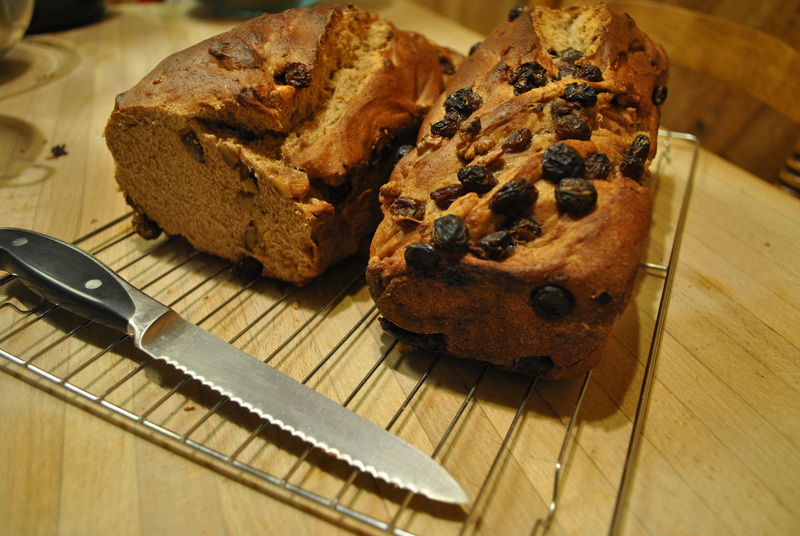 This bread recipe was adapted from an AllRecipes recipe. 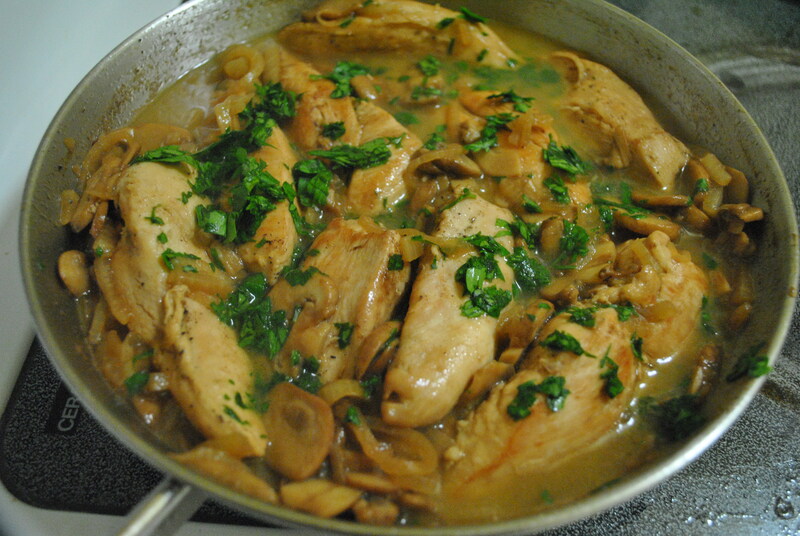 It was pretty great – and even better because I used garlic olive oil which really brought out the flavor. I could say more, but I have a trip to prep for, and I’ll let the pictures speak for themselves. In a large bowl, dissolve yeast in warm water. Add 1 Tablespoon of sugar to the warm water – this will proof the yeast. Let stand for about 10 minutes, until frothy. Stir in sugar, milk, egg, salt, and enough flour to make a soft dough. 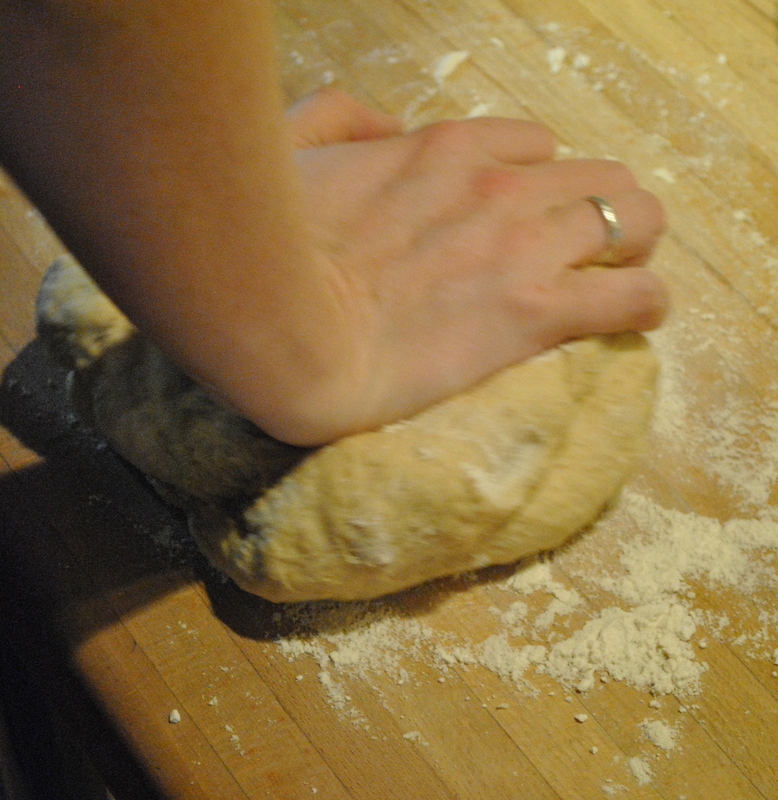 Knead for 6-8 minutes on lightly floured surface until dough is smooth. 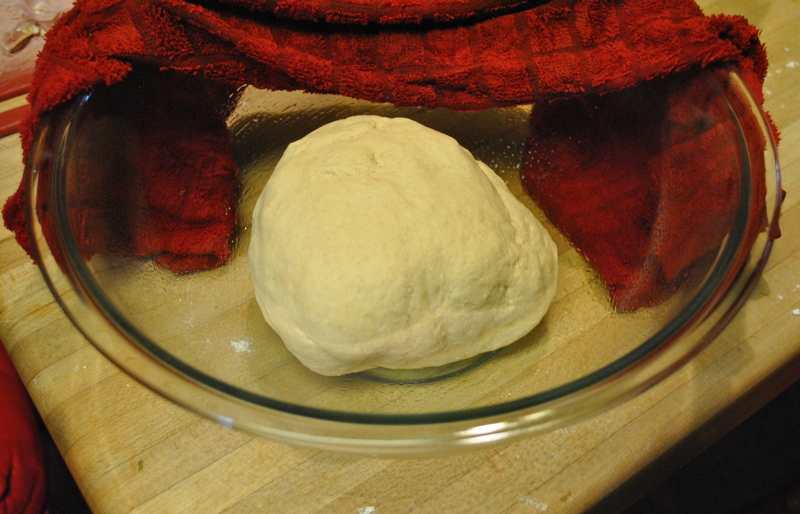 Place dough in an oiled bowl, cover with a damp cloth, and set aside to rise until doubled, about one hour. 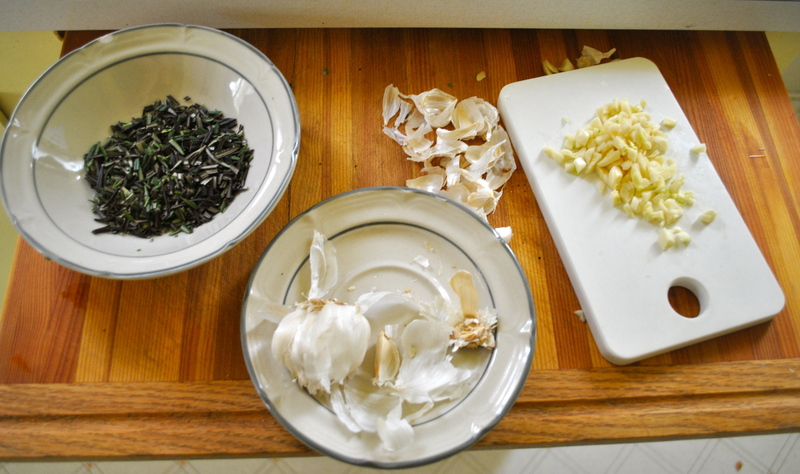 Remove dough from bowl and knead in garlic. Pinch off handfuls of dough about the size of a golf ball. Roll into balls and place on an oiled tray. Cover with a towel and allow to rise until doubled in size, about 30 minutes. 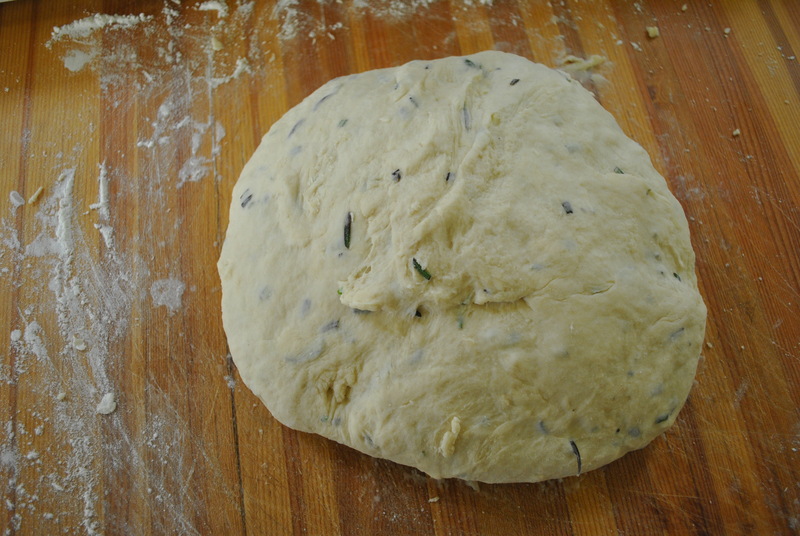 After dough has risen, roll one ball of dough into a thin circle. Lightly oil grill. Place dough on grill, and cook for 2-3 minutes or until puffy and lightly browned. Brush uncooked side with butter, and turn over. Brush cooked side with butter, and cook until browned, another 2 to 4 minutes. 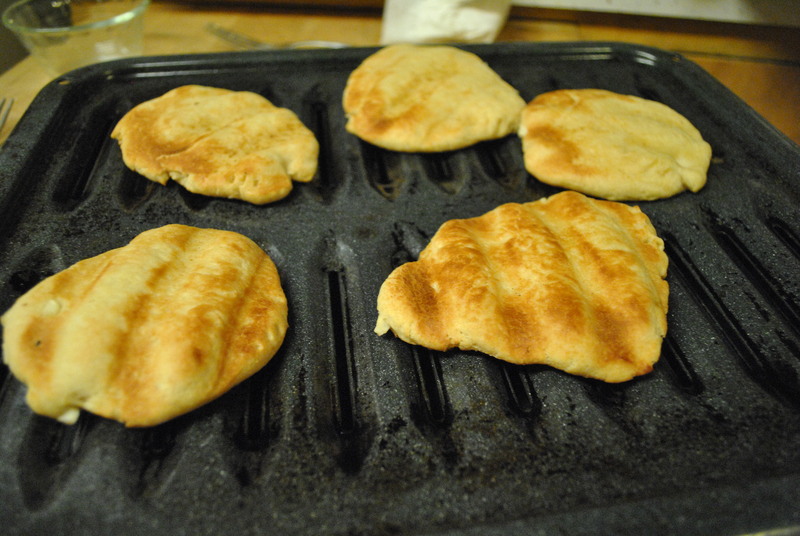 Remove from grill, and continue the process until all the naan has been prepared. Growing up, I never ever ate brussel sprouts. This was an inherited dislike, because my father had a bad experience with brussel sprouts when he was a kid and now can’t even look at them. As a result, we never cooked them or ate them, and I didn’t even know what they looked like until a few months ago. Wow, was I missing out! 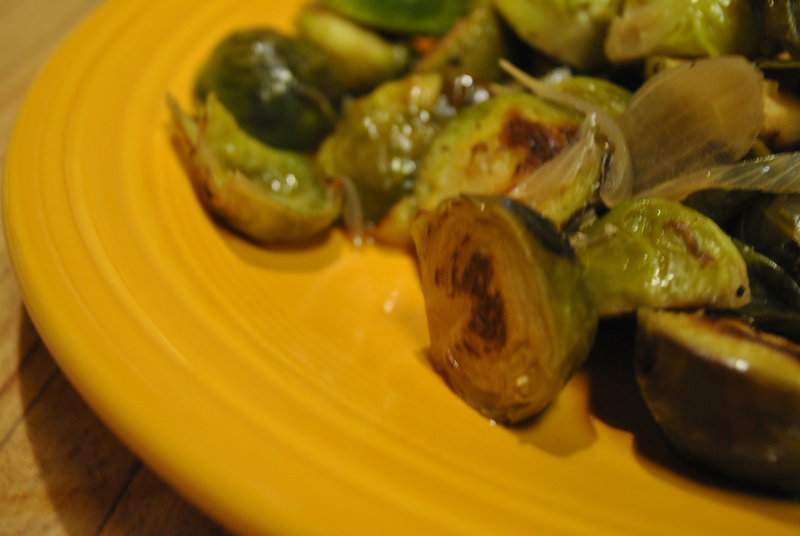 When they are cooked the right way, brussel sprouts are melt-in-your-mouth delicious. You can eat these little buttery balls of goodness on their own, over rice, with quinoa, you name eat. I recently ate brussel sprouts baked into a pastry pinwheel at a restaurant, and it was probably the most amazing appetizer I’ve ever had. I haven’t been able to re-create that one yet, but this recipe from Smitten Kitchen is equally delicious. 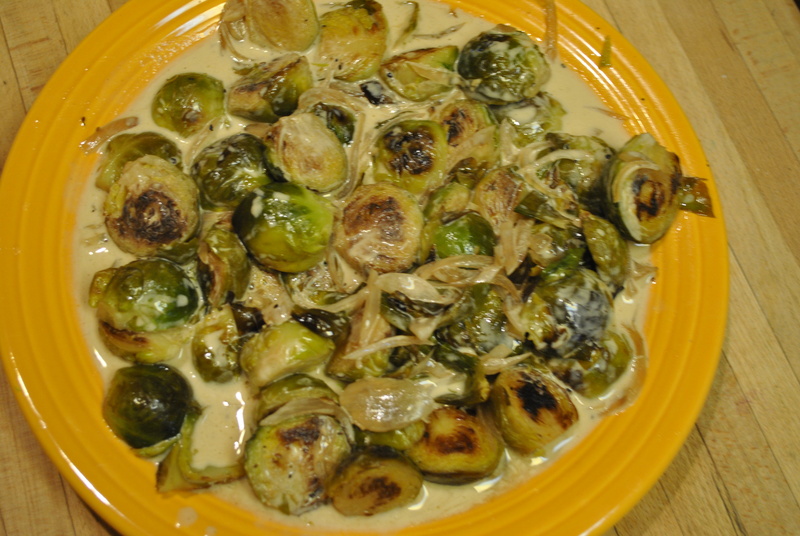 Many brussel sprouts recipes tend to be on the fatty side, with bacon and cream, but this recipe uses dijon to spice things up. Yum! Trim sprouts and cut in half. In a large, heavy 12-inch skillet heat butter and oil over moderate heat. 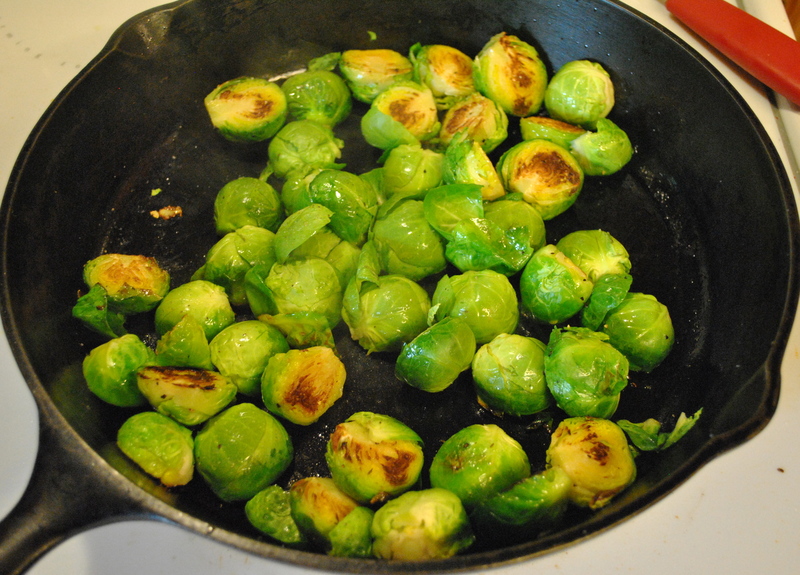 Arrange halved sprouts in skillet, cut sides down, in one layer. Sprinkle with salt and pepper, to taste. 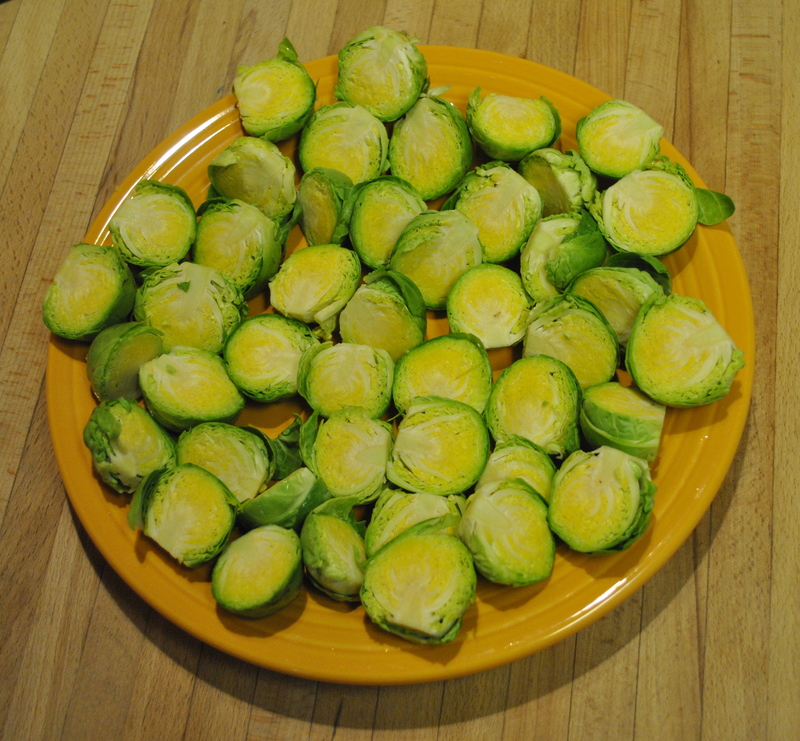 Cook sprouts, without turning until undersides are golden brown, about 5 minutes. Note: skillets can heat up quickly and you want to brown your sprouts without burning them. To make sure this doesn’t happen, you can turn the heat down to medium-low after a few minutes and check your sprouts after a couple minutes. Note #2: If your sprouts don’t fit in one layer, brown in batches and add them all back into the pan when you continue with shallots, wine, etc. Add the shallots, wine and stock and bring to a simmer. 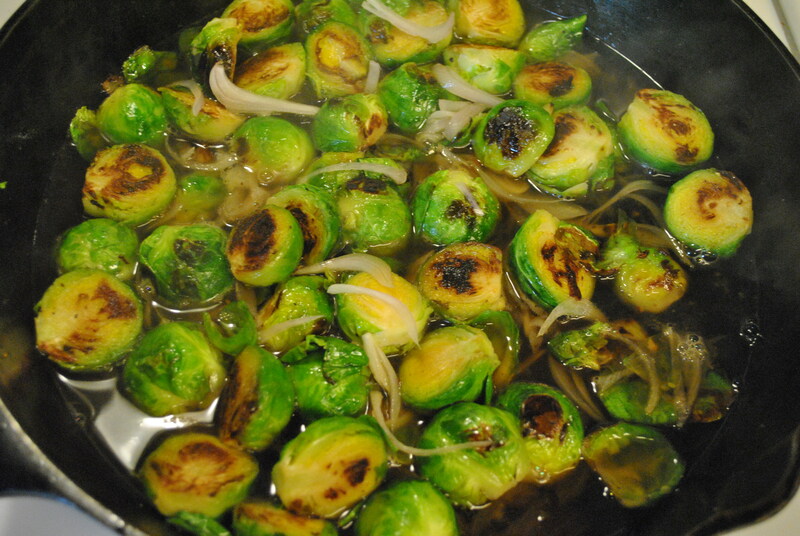 Once simmering, reduce the heat to medium-low (for a gentle simmer), cover the pot with a lid (foil works too, if your skillet lacks a lid) and cook the sprouts until they are tender can be pierced easily with the tip of a paring knife, about 10 to 15 minutes. Remove the lid, and scoop out brussels. Add cream and simmer for two to three minutes, until slightly thickened. Whisk in mustard. 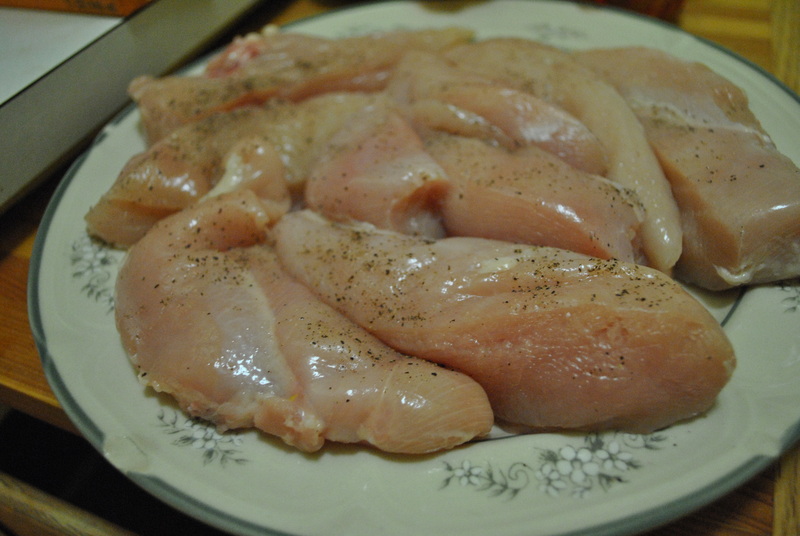 Taste for seasoning, and adjust as necessary with more salt, pepper or Dijon. 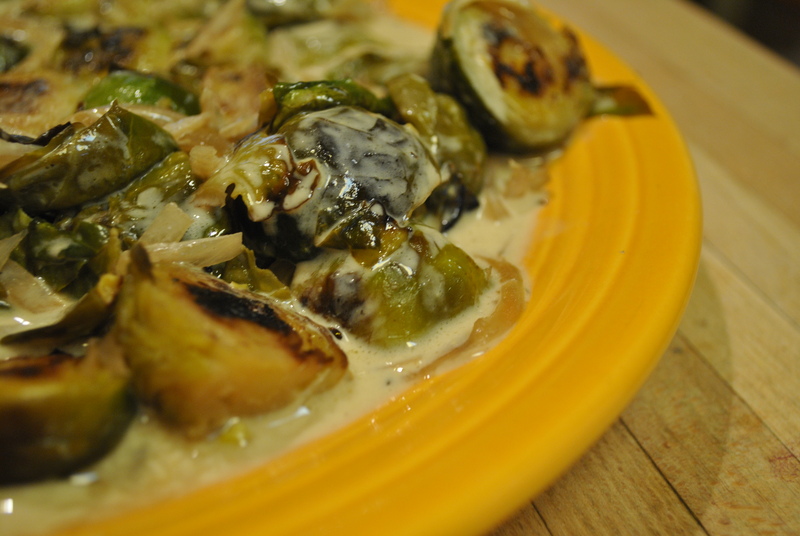 Pour sauce over brussels and serve immediately. It has been one busy month. I neglected blogging because I was in the midst of getting accepted to the Peace Corps, celebrating Christmas with my family, finishing work, saying goodbye to all my friends, and moving from Seattle back home. Being in transition, my kitchen was packed up, my camera had disappeared, and blogging was the last thing on my mind. Now I’m all settled back into home-sweet-home (phew! ), and I have a whole list of recipes that I’m eager to try. In the midst of that busy month, we had CHRISTMAS! I love Christmas, especially when I find some perfectly creative or funny gift for my friends/family. This year, my brother and I scored. Seeing as he was the one to introduce me to Mad Men, I saw this gem of a book at Powell’s and knew I had to get it for him. He was thinking along the same lines, and when he went to Barnes and Noble he found The Unofficial Hunger Games Cookbook. If you haven’t heard of The Hunger Games, you need to get your head out of the sand and go find (and read) these books. I won’t spoil anything by talking about the ending, except to say that it’s hard to have a well-formed opinion until you’ve read them all, and then you can discuss what you think about it FOR DAYS. I’m serious. I’m anxiously awaiting the release of the movie and thanking my lucky stars that it comes out the week before I move to Indonesia. Back to the cookbook, it is not affiliated with the actual series by Suzanne Collins (you could probably figure that out by the ‘unofficial’ part of the title), but the author Emily Baines has a whole introduction about how food is crucial to the plot line of The Hunger Games. She took that concept and looked at every instance of food in the books and created recipes that correlate to the food that you read about. Each recipe has a (pretty cheesy) title that relates to a character or plot twist, and there’s a little blurb describing something from the book that relates to this recipe (including book and chapter references). There’s some with exotic animals that are probably not do-able, but some sound pretty amazing and simple to make. This bread is the first recipe I’ve tried from the book, and it’s DELICIOUS. Note: It’s important to not kill your yeast! Activating yeast is the first step in making bread, so if you kill your yeast it’s game over from the start. Avoid that step by making sure that the temperature of your water is not too hot. Boiling is too hot. A good piece of advice is to use warm tap water: turn the faucet to hot, run until you put your finger in and want to pull it out but not so hot that you burn your finger. For additional yeast tips, see my last bread-making post. In a mixing bowl, dissolve yeast in the warm water until foamy, about 5 minutes. Stir. Add the milk, butter, honey, salt, cinnamon, sugar, eggs, and whole wheat flour. Beat until smooth. Stir in enough all-purpose flour to form a soft dough. 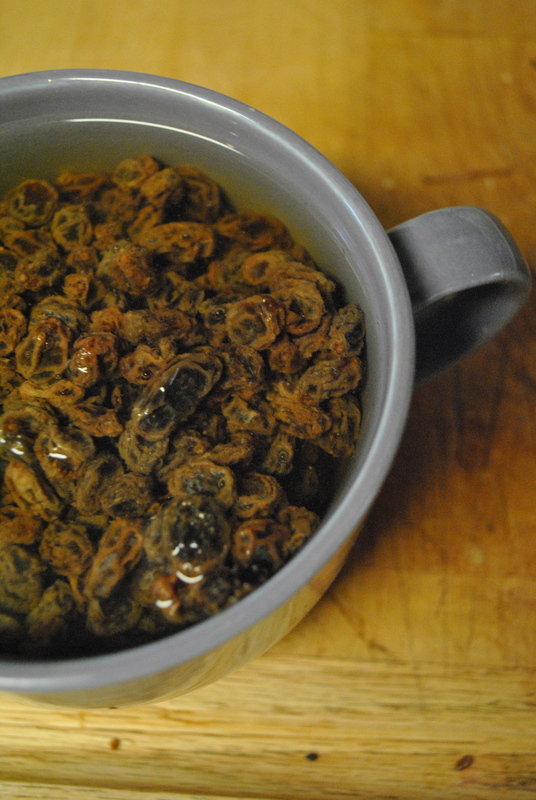 Meanwhile, soak raisins in a bowl of tepid tap water. 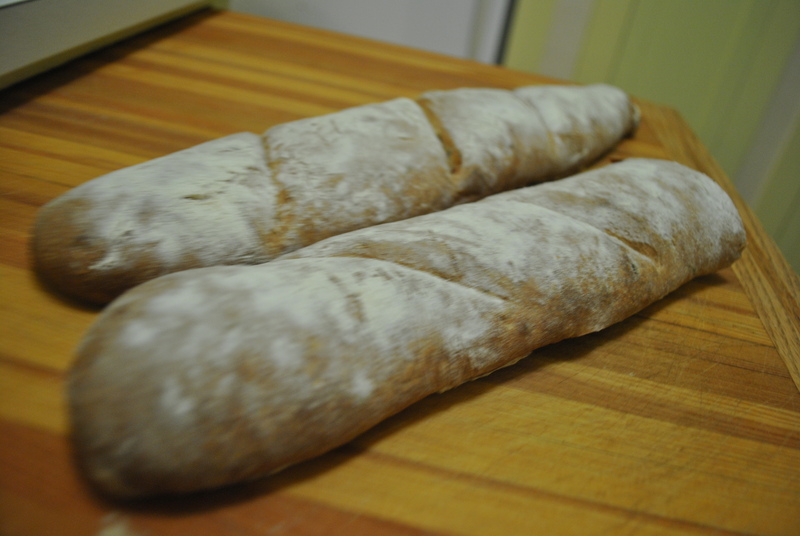 Be sure to drain and pat dry before you use them (I didn’t do this and my bread got really sticky – yuck!). Grease two 8.5″ x 4.5″ loaf pans (sizes that are slightly different, as mine were, will also work). Punch dough down. 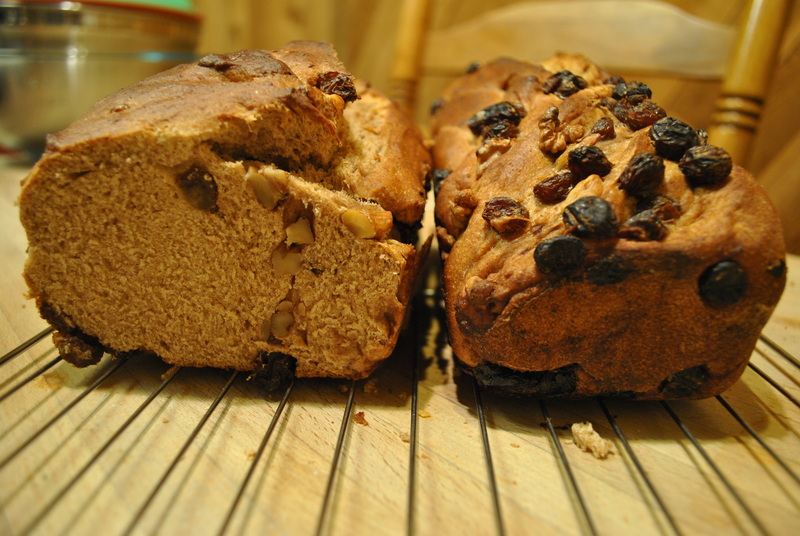 Turn out onto the lightly floured surface; sprinkle with raisins and walnuts and knead them in. Divide dough in half. 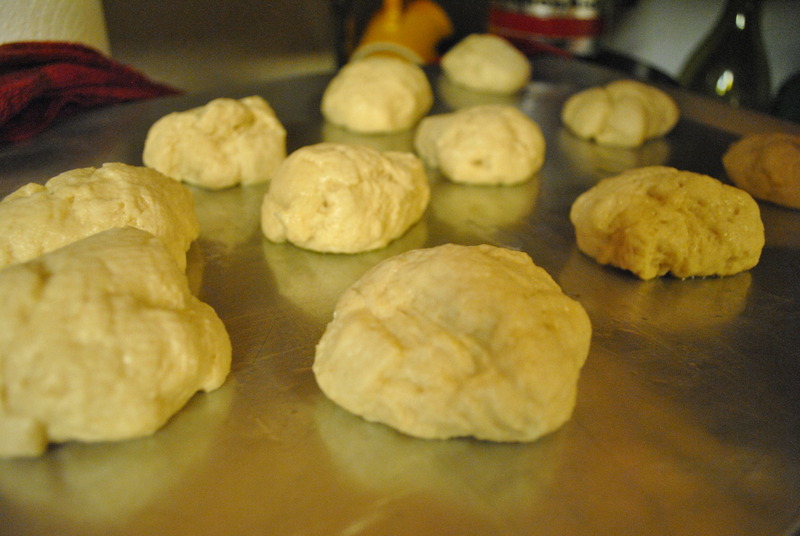 Roll dough into loaves, place loaves in greased pans. Cover and let rise until doubled, about one hour. Beat egg white and cold water; brush over loaves. Bake at 375 for 40 minutes, or until golden brown. If the tops are browning too quickly, you can cover them loosly with foil for the last 15 minutes. Cool in pans for 15 minutes. Remove from pans to finish cooling on wire racks. Maybe it’s a blogging faux paus to write about something I (gasp!) bought at a store, rather than making completely from scratch, but as I’m sitting here eating my beef and broccoli leftovers I just really want to pass on the knowledge of one of my most favorite (and easiest meals). Not to mention this is the perfect opportunity to write about why Trader Joe’s (in my mind) surpasses even Disneyland as the Happiest Place on Earth. Am I exaggerating? Only a little bit. Let’s be honest, where else can you find organic virgin coconut oil in a jar? Where else is low-fat coconut milk only 99 cents a can? And lest you think their wonders are confined to the realm of the coconut, think again! There’s pumpkin pancake mix, frozen pork potstickers, frozen garlic naan (frozen food never tasted better), seasonal teas like Candy Cane Peppermint goodness, and who can forget to mention 2 buck Chuck? So now that we’ve established that Trader Joe’s is BOMB, here’s one of my all-time favorite products: Korean style marinated beef. I won’t lie, it’s not cheap at an average of about $9 for a package. (Although it will feed 3 people, so that becomes only $3 a person which is not too spendy compared to a meal out.) So splurge a little – you’ll be glad you did! 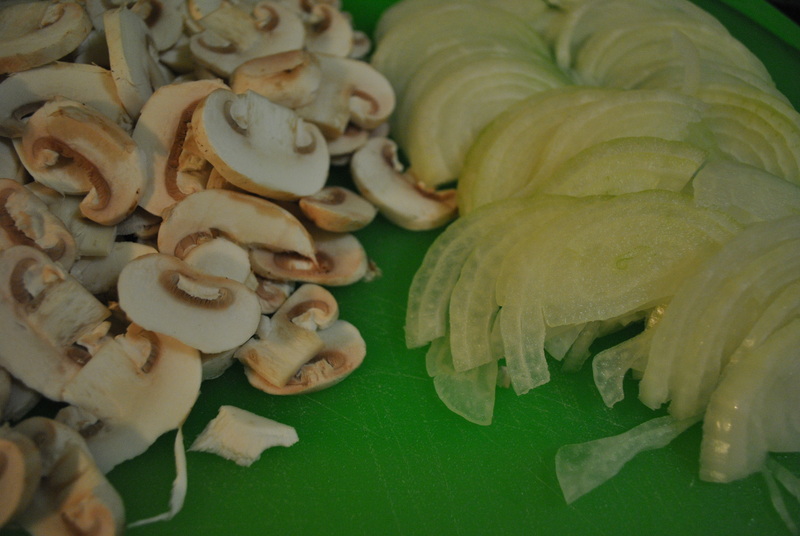 Chop the meat into small pieces (the smaller, the faster they will cook). Rinse broccoli, trim stems, and chop into smaller pieces. Mince garlic. Heat oil in a pan or wok. 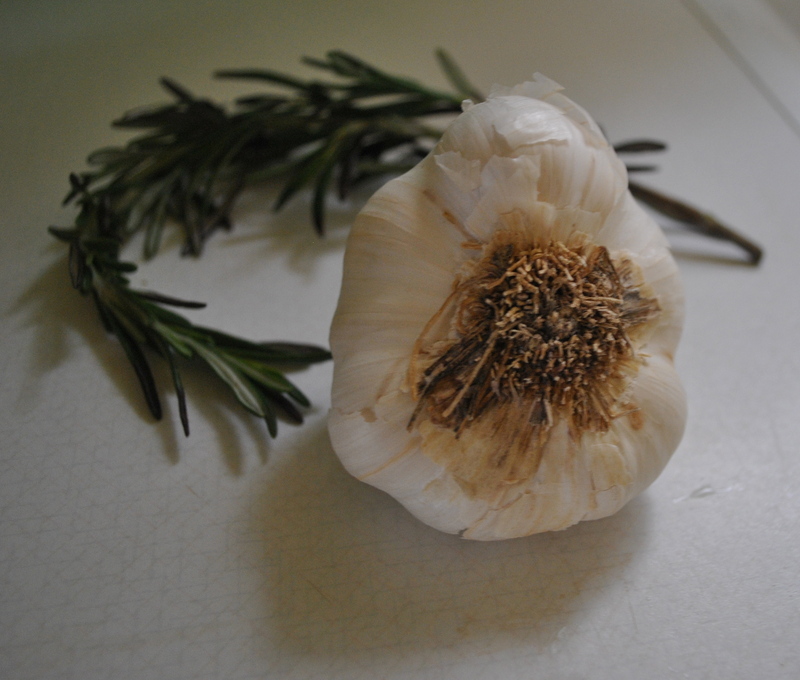 Add garlic and saute for 2-3 minutes. Add meat, cooking until browned. 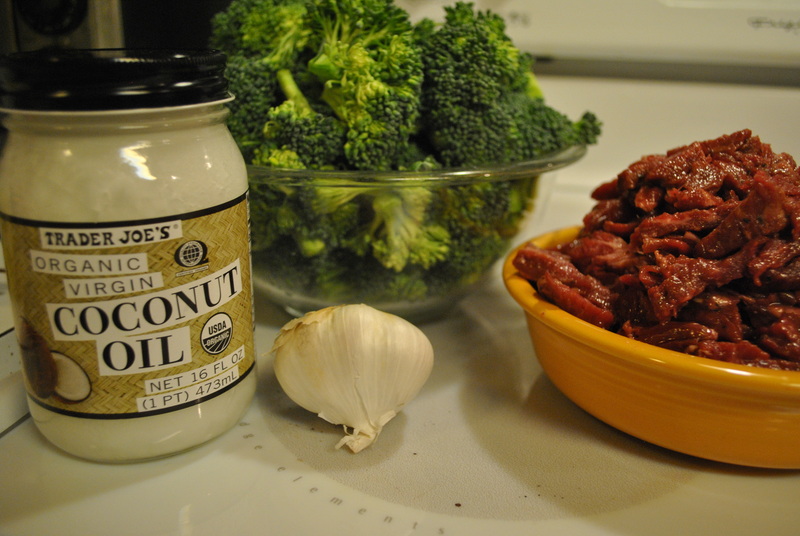 Add broccoli and continue to saute until broccoli is cooked through. Although the meat has its own (delicious) marinade, I often add a bit of soy sauce at this point. 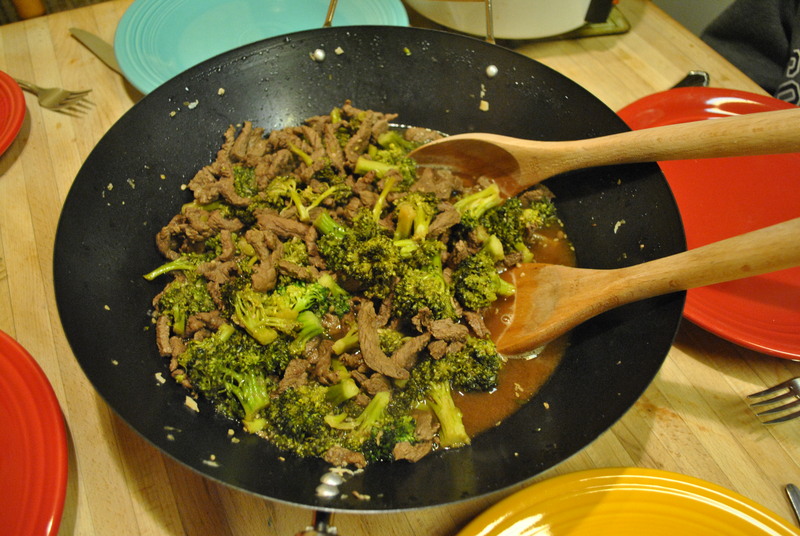 If the meat is pretty much cooked but I’m waiting on the broccoli, I will usually cover the pan with a lid, turn down the heat to low, and steam the broccoli until it is finished. I finally bought a muffin tin. Finally. And a whole new world has been opened up to me…beginning with this scrumptious recipe that I’d been eyeing from Smitten Kitchen for some time. It’s December now, but back when I made these it was in the midst of a gloriously sunny autumn, and I was overflowing with apples. 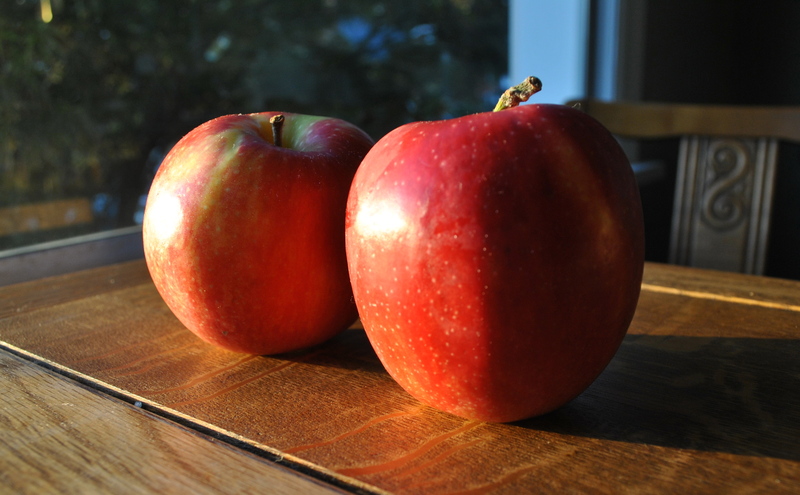 This recipe was probably my favorite to use up those extra apples because it was very forgiving when I used old apples. Secondly, this freeze well and taste almost as good out of the freezer as they do fresh – I have a good stash in my freezer and I just pop one out to add to my lunch every day. It thaws by the time I want to eat it. It’s a perfect rhythm. And last but not least, the combination of whole wheat and apples makes it a healthy snack (at least healthier than other things I COULD be baking)! Preheat the oven to 450°F. If you are using a muffin pan, grease and flour. If you’re using liners, which are much easier and less mess and make for better pictures, then just pop ’em in the pan, and you’re good to go. Mix together the flours, baking powder, baking soda, salt, and cinnamon, and set aside. 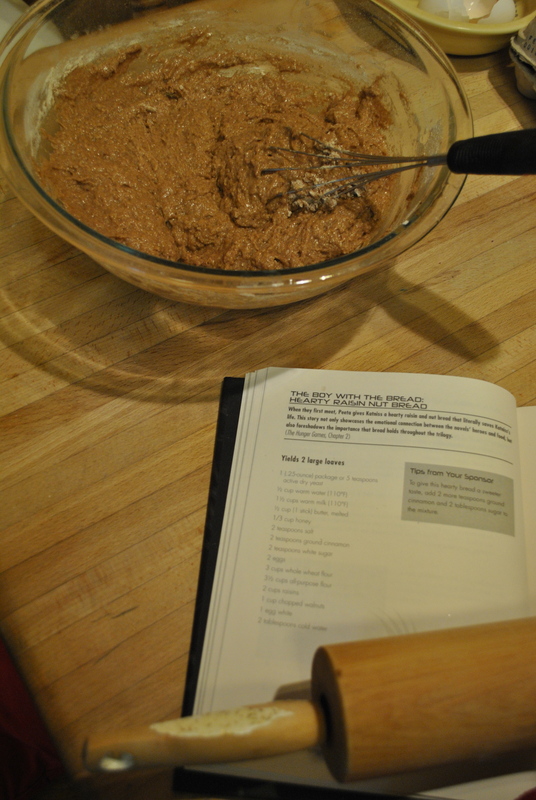 In a separate bowl, cream the butter and add the granulated sugar and 1/4 cup of the brown sugar. Beat until fluffy. Add the egg and mix well. Mix in the buttermilk gently. (If you over-mix, the buttermilk will cause the mixture to curdle.) 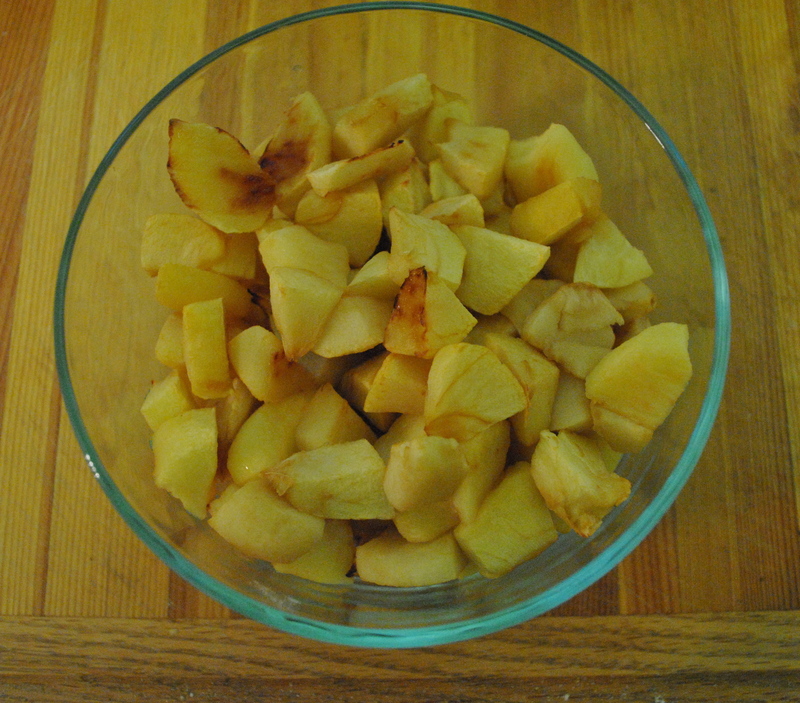 Stir in the dry ingredients and fold in the apple chunks. Eat and enjoy! Alternatively, freeze and enjoy later! I love whole wheat. Besides the gritty texture (which I really do like), it assuages my guilt of only eating white flour for all those other times when I’m baking. You may not realize it since the majority of the recipes I’ve posted have been sugary and/or fatty delicious baked goods, but I actually have a keen interest in the nutritional content of foods that I eat, and I LOVE when I find that I can replace something less nutritionally-dense for something better. 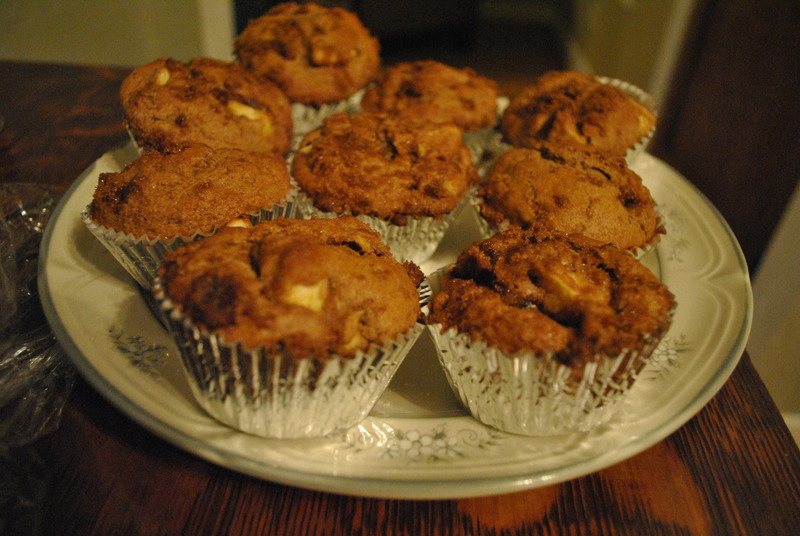 Thus, my love of whole wheat in my favorite baked goods. As Deb from Smitten Kitchen notes, the dough used for this recipe is VERY sticky and damp. Resist the temptation to add additional flour – just use as much as you need on your surface and your hands. The end result will be well worth this sticky situation. Preheat oven to 425 degrees. Line a large baking sheet with parchment paper. In the bottom of a large bowl, whisk flours, baking powder, sugar and salt together.Add the butter and use the blender to both cut the butter into the flour mixture until the biggest pieces are the size of small peas. 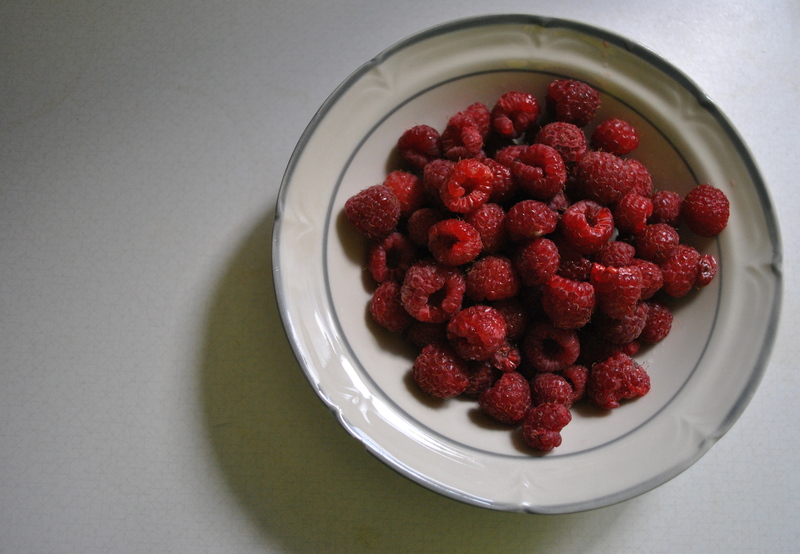 Toss in raspberries and use the blender again to break them into halves and quarter berry sized chunks. Add the ricotta and heavy cream together and stir them into the dough (using a flexible spatula is the best way to do this). The dough will look messy – that’s a good thing! 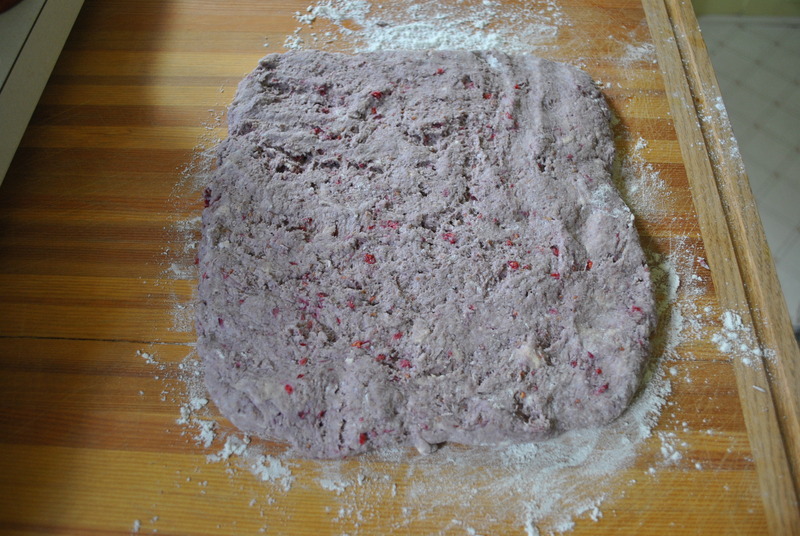 With as few movements as possible, transfer the dough to a well-floured counter, flour the top of the dough and pat it into a 7-inch square about 1-inch tall. 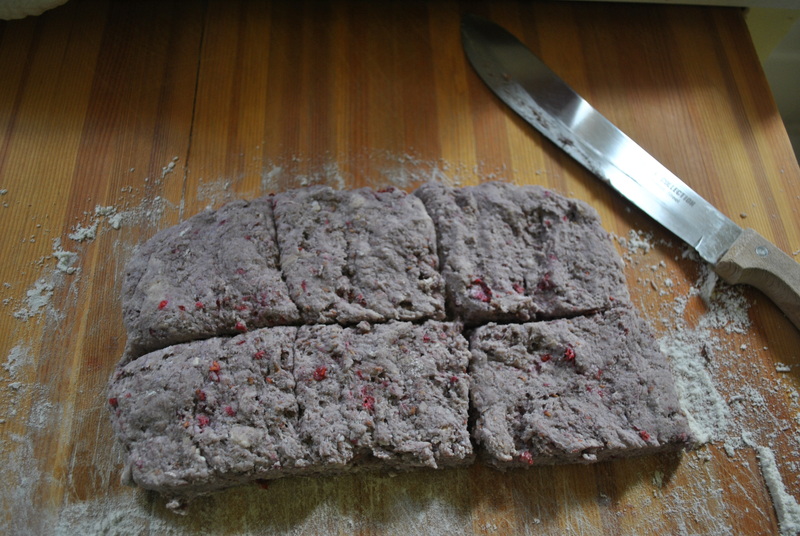 With a large knife, divide the dough into 9 even squares. Transfer the scones to prepared baking sheet with a spatula. 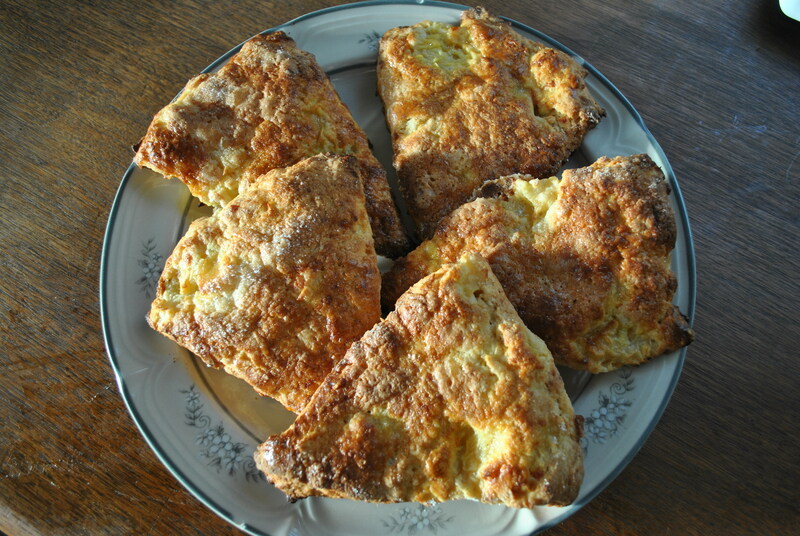 Bake the scones for about 15 minutes, until lightly golden at the edges. Cool in pan for a minute, then transfer to a cooling rack. These scones are best when they’ve cooled halfway (or more) so they can set. 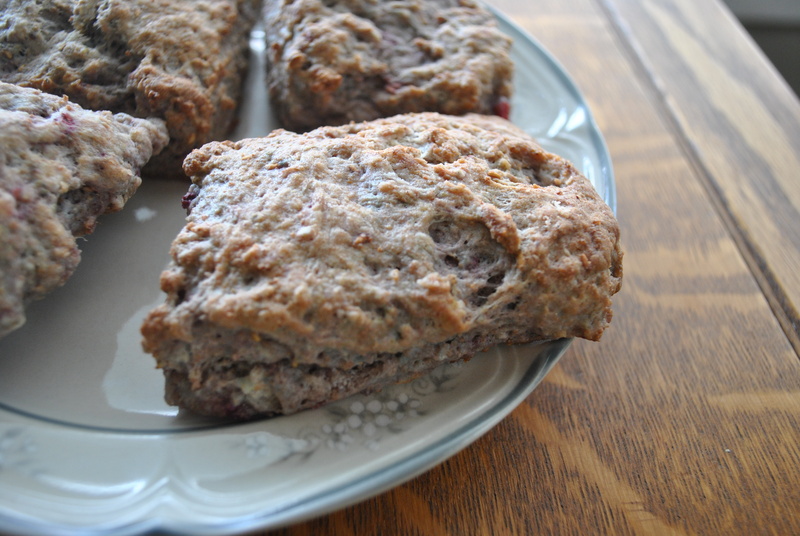 If you need a little practice with the virtue of patience, these are the scones for you! P.S. Aren’t square scones the cutest? * To freeze unbaked scones simply cut the dough into desired scone shape, place them on a tray in the freezer, freeze until they are hard, and then you can put them into ziplock bags and leave them until you’re ready for a hot scone for breakfast or an afternoon snack. The best part? You don’t even have to thaw them, just add a couple minutes to the baking time and you are good to go. And one more thing, if you’re looking to make a whole, delicious meal out of this, I suggest serving the chicken marsala over angelhair pasta with a glass of wine and some toasty bread. A side of vegetables is probably also a good nutritional choice. 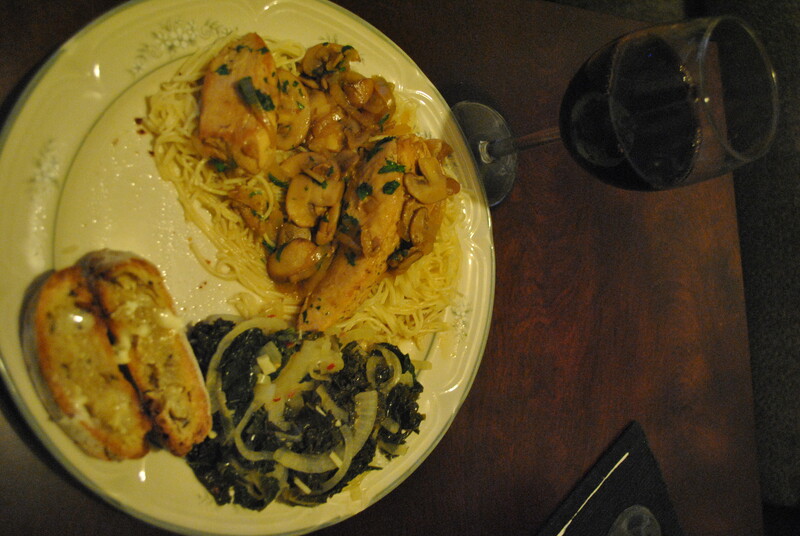 My mom and I served this with spicy braised kale, rosemary garlic bread, and merlot. I’d have to say, it was one of my favorite meals of 2011. 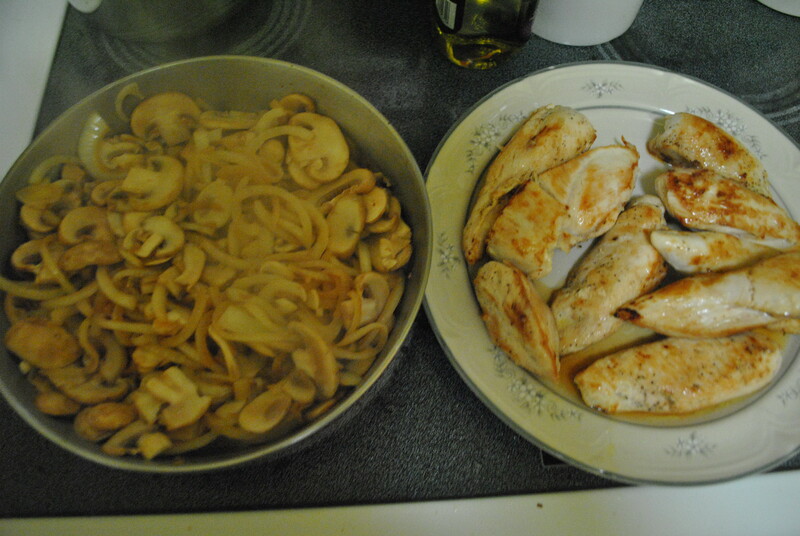 Sauté onion and mushrooms in the same pan with the butter-oil-fat mixture (doesn’t that just sound appetizing) from the chicken, stirring occasionally, until liquid mushrooms give off is evaporated. Add marsala and cook mixture, stirring, for 5-10 minutes. 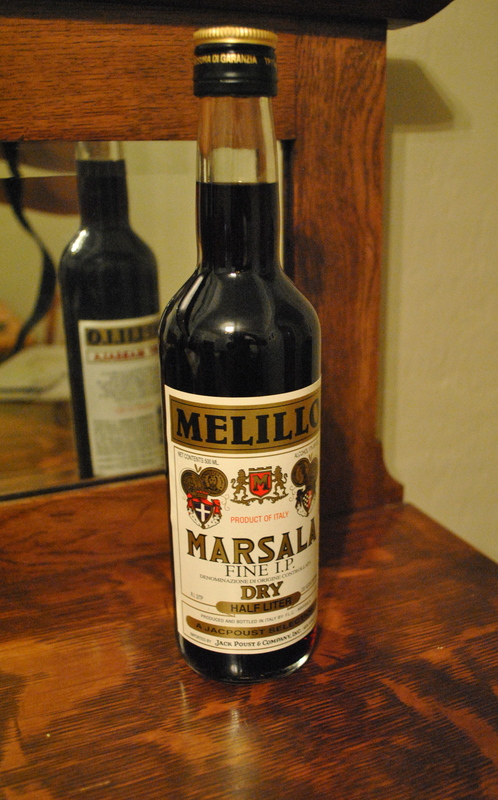 Smitten Kitchen calls for the marsala to cook off until it’s almost all evaporated but I prefer more liquid. Add broth and chicken with any juices that have accumulated on plate and simmer, turning chicken once, until cooked through, about 15 minutes. Add salt and pepper to taste and garnish with parsley. Look, look, it’s a recipe that didn’t come from Smitten Kitchen! Ha. Instead, this is from another favorite food blog Always With Butter. I absolutely adore this blog because it combines breathtaking photography with delicious recipes. It’s the kind of blog that almost makes me too intimidated to even try…but then I forget my intimidation as I rush to the store to stock up on whatever ingredients I need to make the next amazing thing. This rosemary garlic bread is DIVINE. 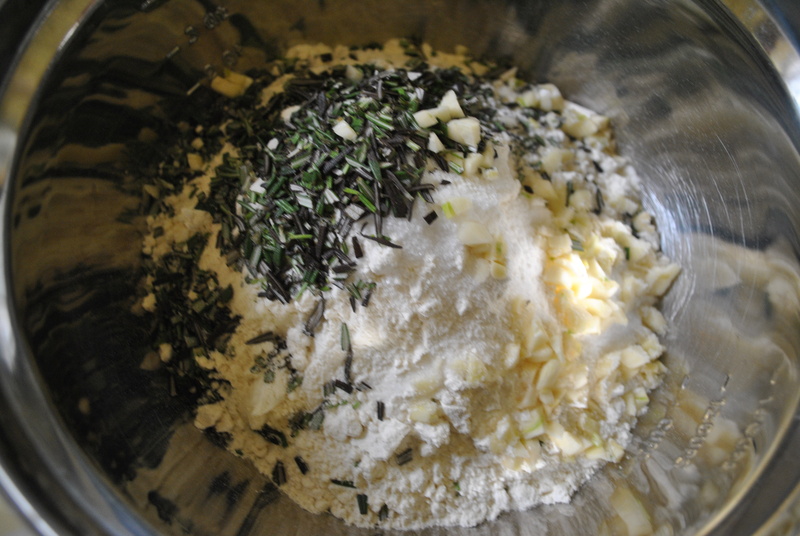 Of course, when you’re combining olive oil, garlic, rosemary, and sea salt, how can you go wrong? I even killed my yeast, altered the rising times, and partially overbaked it, and it was still some of the most delicious bread I’ve had in a long time. And that leads me to a confession: I have basically no experience making bread and yeast is not very forgiving. It’s a trial-by-fire kind of process and you have to be committed because there’s hours and hours of rising and baking before you even know if it worked. In my case, I killed the yeast right at the beginning by using water that was much too hot (recently boiled water = not good! My friend Noah, who is basically a bread expert – at least compared to me – told me he simply uses warm tap water and that’s hot enough to activate the yeast without killing it). Noah also saved my bread from an early death by teaching me to alter my rising times after I let the bread rise too much the first time (simply cut back on the second rising time) and he helped me determine when it was finished baking. Thank you, Noah! Pretty sure I couldn’t have done it without you. Anyway, back to the recipe: learn from my mistakes and I’m sure you will make an even better loaf. Sprinkle the yeast on the surface of the water, let stand for 3 minutes. Whisk to combine, then whisk in oil. Dust two baking sheets with flour. 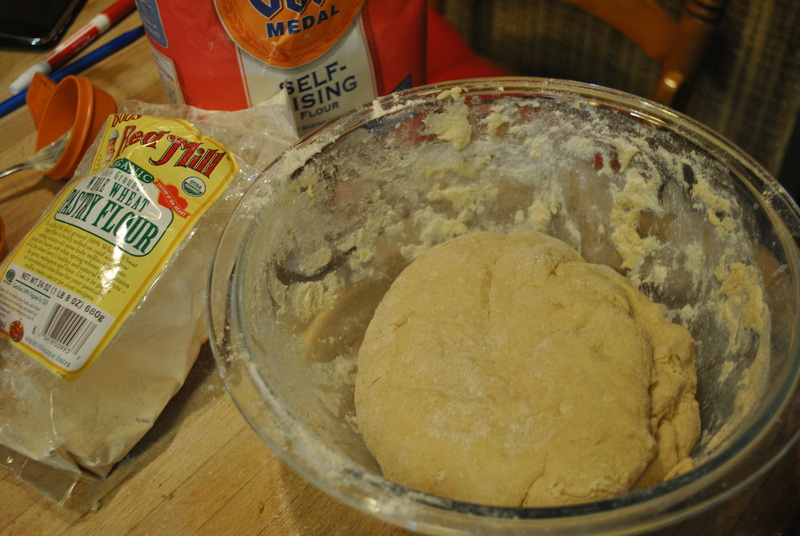 Place dough on a lightly floured surface and press dough to deflate. Divide in half. Roll out into a square and then roll tightly into a log. Place each log on a baking sheet and dust heavily with flour. Cover both with a towel and let rise until doubled in size, 1-2 hours. Heat oven to 500 degrees and place the racks on the lowest shelf of oven. Cut 3 slashes in the top of both loaves. Place in oven and reduce temperature to 450. Bake for 20 minutes, lower temperature to 250 and bake for an additional 20-30 minutes. Serve warm or at room temperature. Note: I also froze a loaf of this bread and it still tasted wonderful when I pulled it out of the freezer. I haven’t blogged on here in so long, it’s almost unforgivable. I have no excuses, other than the fact that I’ve been busy and lazy and I tend to blog when I’m not using my laptop that has all my pictures of food on it. But fear not, I intent to post everything that I am behind on. 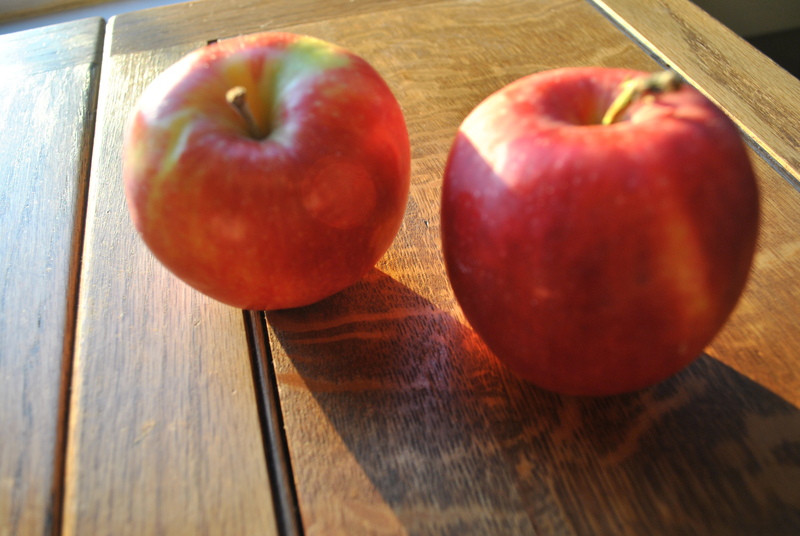 I’m sure that all of my faithful readers (all two of you) have been dying to know what I did with those apples pictured in my previous post. Well, you’re the best for waiting two+ months to find out. 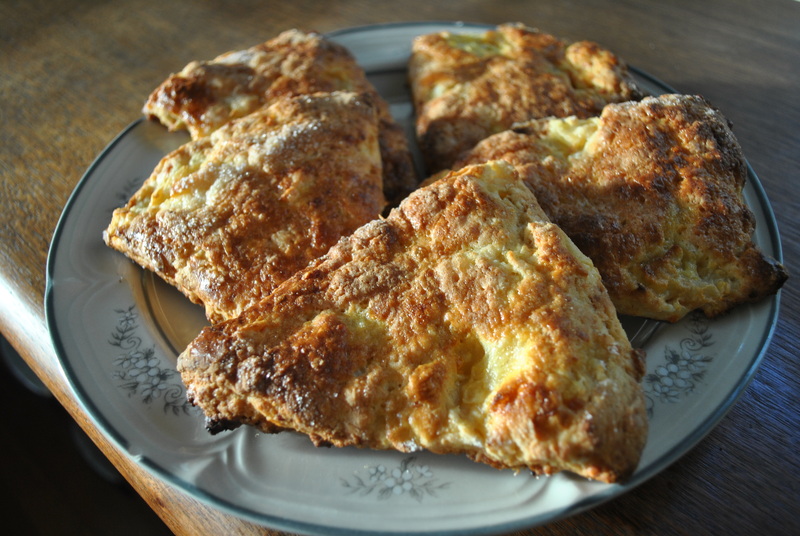 The answer is that I turned them into delicious apple cheddar scones! Another recipe straight from Smitten Kitchen (my food blog could basically be dedicated to Smitten Kitchen…as you will find, I’m simply reposting many of her recipes with my pictures) because, you know, Smitten Kitchen is simply the best. These scones are a little more work-intensive than other scones (and trust me, I’ve been on a scone kick lately, so I know), but it really pays off in the end. They can be frozen unbaked: simply cut them into desired scone shape, place them on a tray in the freezer, freeze until they are hard, and then you can put them into ziplock bags and leave them until you’re ready for a hot scone for breakfast or an afternoon snack. The best part? You don’t even have to thaw them, just add a couple minutes to the baking time and you are good to go. Peel and core the apples, then cut into chunks. Place them on a baking sheet lined with parchment paper and bake until they have a little color and feel dry to the touch. This should take about 20 minutes (mine were closer to 15 but I have an exceptionally hot oven). The apple chunks will then be half-baked (mmmmm half-baked, my favorite Ben&Jerry’s ice cream!). They need to be cooled completely, either on the counter or (to expediate the process) in the fridge. 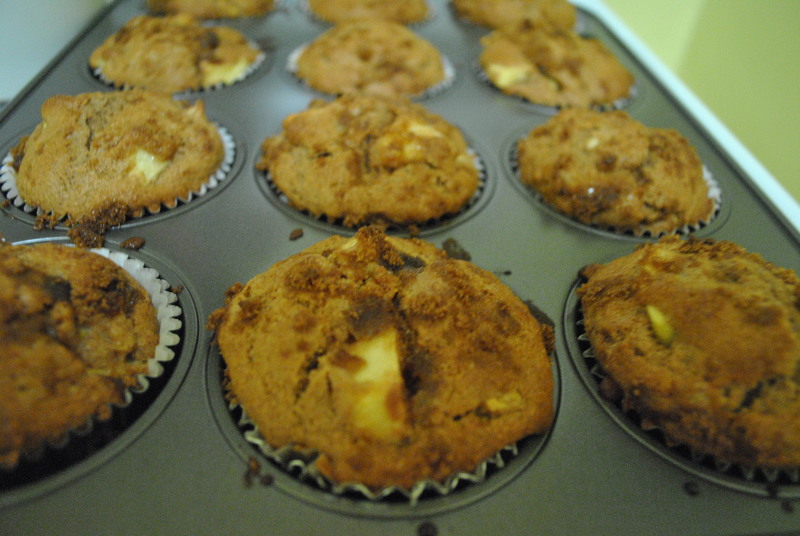 When I made these, I did the scones in two steps and left the apple chunks in the fridge for a day. They were fine. Note: If you are doing this project in one day then leave the oven on to remain pre-heated for your scones! 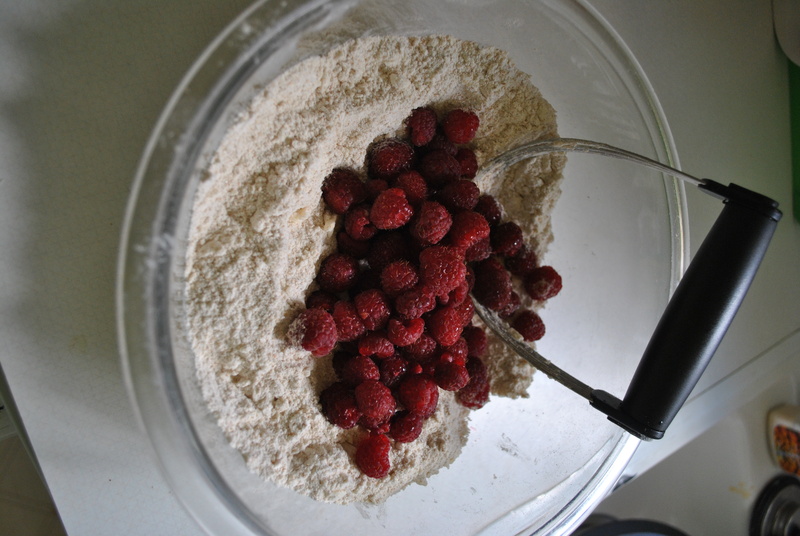 Sift or whisk flour, sugar, baking powder and salt together. Now, if you have a mixer you can refer to Smitten Kitchen’s instructions on this part, but for me, I just used my hands because I have no electric mixer. Using a pastry blender, rub butter chunks into flour mixture. 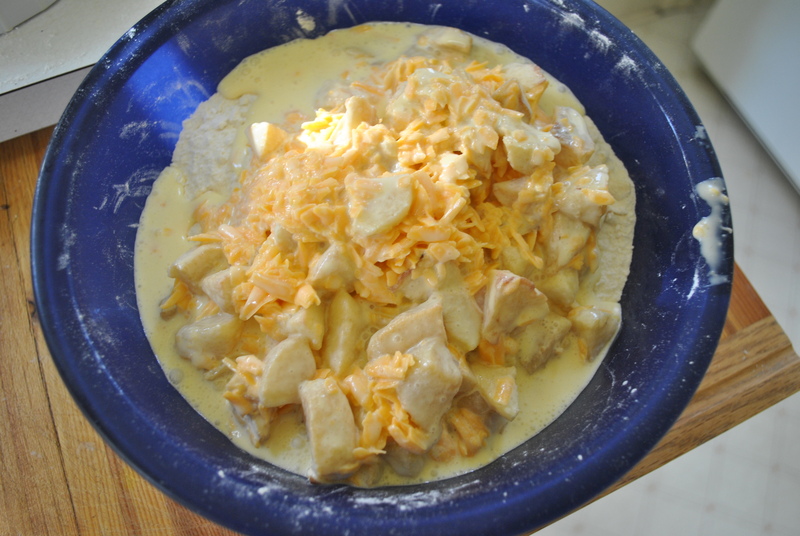 Add the apple chunks (they made need to be chopped coarsely if they are large chunks), cheese, cream, and one egg and mix together with a wooden spoon. This will be a sticky mess, but trust me, it’s a delicious sticky mess. Flour your counter top, place the dough on it, and sprinkle with additional flour. 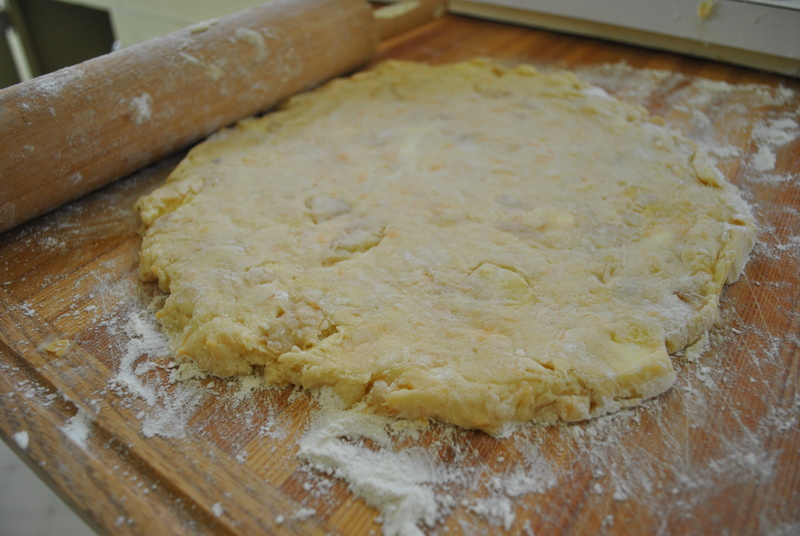 Roll or pat the dough into a 1 1/4-inch thick, 6-inch circle. Cut the circle into wedges (mine made 8). 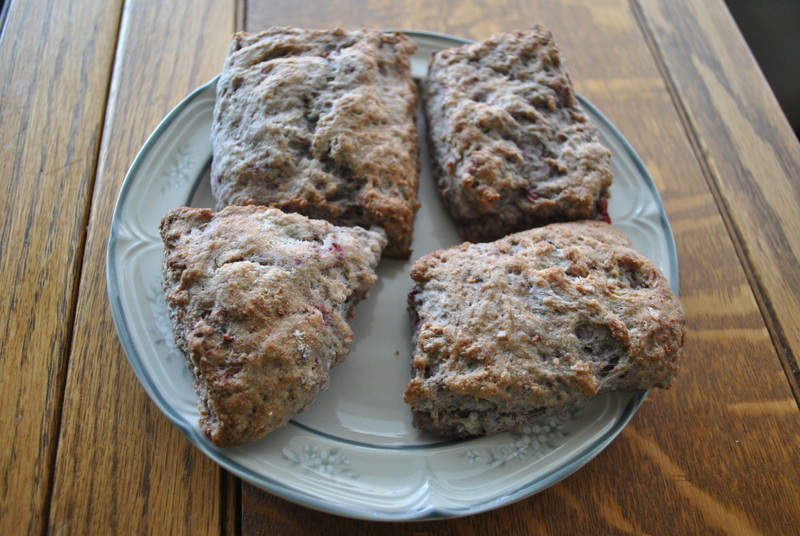 Transfer to a baking sheet lined with parchment paper, leaving a couple inches between scones. Beat the remaining egg in a small bowl with a pinch of salt. Brush the scones with the egg wash and sprinkle with sugar. Bake until firm and golden, about 30 minutes. Cool for about 10 minutes before eating.